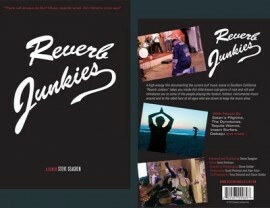 Reverb Junkies is a high-energy feature film documenting the current surf music scene in southern California. Shot over the course of the summer of 2010, "Reverb Junkies" takes you inside this little known sub-genre of Rock and Roll. This documentary introduces you to some of the people playing the fastest, hottest instrumental music around and to the rabid fans of all ages who can't get enough. Executive Producer/Director Steve Seagren, along with Producer Alan Altur, Producer Tony Dimond and Producer/Director of Photography Steve Gelder shot almost 200 hours of live performances and interviews with some of the best surf music bands from southern California and the world, including The Ghastly Ones, The Dynotones, The Space Cossacks, Surfside IV, Thee Swank Bastards and Szandora, Wadadli Riders from Antigua, Space Rangers from Germany, The Tequila Worms, Creepy Creeps, CHUM, Jason Lee and the R.I.P.Tides, Exene Cervenka from X, Dominic Priore (author of 'Pop Surf Culture'), Tiki Tena, surf radio hosts Clint Beachwood and Cousin Mary, Glasgow Tiki Shakers, Pyronauts, Kelp, Pollo Del Mar, and many, many more.